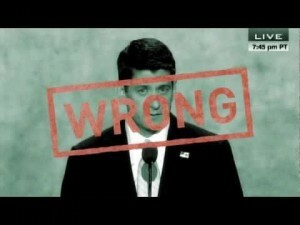 As the election season heats up, Republicans like Mitt Romney and Paul Ryan are stepping up the rhetoric. One of the claims I keep hearing is that “Obama got everything he wanted for 2 years.” This is simply untrue. Yes, normally having majorities in the House and Senate would seem to ensure that bills could be passed by way of majority votes. However, Republicans have threatened to filibuster and thereby paralyze every bill they’ve disagreed with. And the fact that there have always been a small handful of Democrats (generally Blue Dog Democrats) willing to side with Republicans have made these filibusters more than an idle threat. This would not be much of an issue if a handful of Republicans crossed party lines and offset this effect and courting these Republicans (or the Democratic holdouts) have led to some compromises (meaning Obama hasn’t gotten everything he wanted). 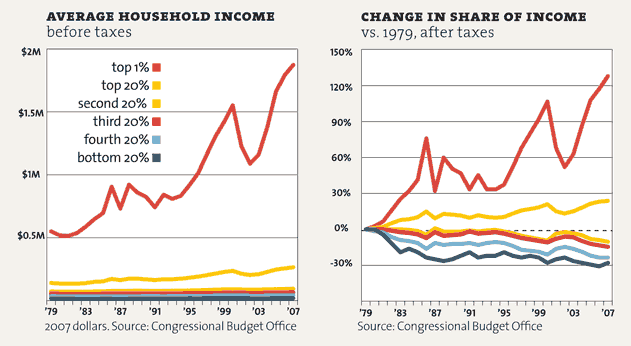 By any measure, the stimulus package has left us better off. The question is could it have been better? Yes, had the $100 billion in aid to state and local governments not been cut (something Republicans demanded before crossing party lines to vote for the bill), state and local governments (who are expected to run balanced budgets) wouldn’t have had to cut so many jobs (the private sector has been adding jobs–it’s the public sector that’s been hurting and largely suppressing the recovery). Nevertheless, the stimulus package helped end the recession and get us back to a point where the economy has had positive job numbers over the last 26 months now. 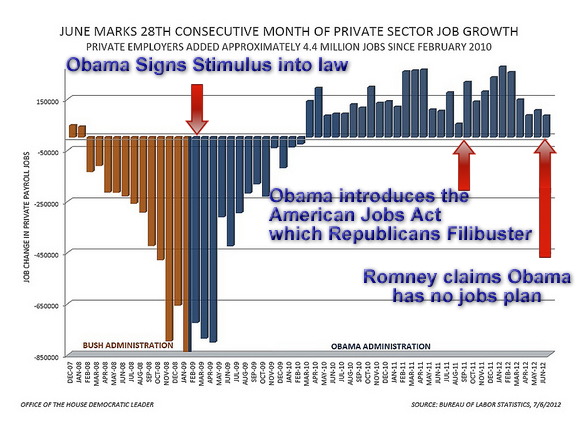 Had Republicans not blocked the American Jobs Act in 2011, we’d be seeing much more robust growth at this point. The original health care bill was designed to have a public plan. In order to get this through the House and Senate, the public plan would have to be gutted (and replaced with a mandate which Republicans used to support but suddenly decided it was government intrusion now that a Democratic president was in office) and some concessions had to be made regarding coverage on abortion in order to gain support by Pro-Life Democrats. 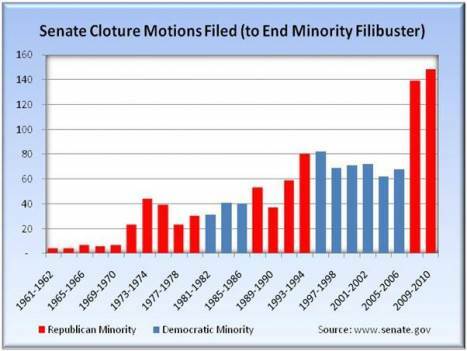 Last but not least, Republicans have set a record for filibusters.